Pittsburgh-based comics publisher Action Lab, announced today in a press release that they were making changes to their marketing staff that effectively breaks the job into three roles. Jeremy Whitley, the writer of one of Action Lab's best known comics, Princeless, is moving out of the primary marketing role and becomes Action Lab's Education Outreach Coordinator. Meanwhile, comics veteran and Molly Danger creator Jamal Igle moves into a role as the press face of Action Lab, handling press, conventions, and details of that nature. Kelly Dale, spouse of Action Lab's Skyward creator, Jeremy Dale, will work with retailers from a marketing perspective. Jim Dietz, who also writes comics for Action Lab, remains in his social media role. 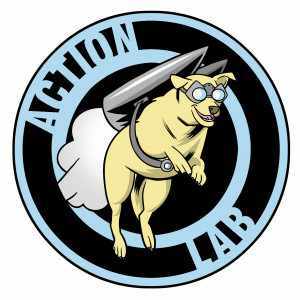 I've been watching Action Lab closely as a publisher, and they have grown steadily in the past few years. It's no surprise to me that they've decided to increase their marketing arm, given that they have digital first comics, the Danger Zone label, and are tabling at nearly every major convention either as a company or as individual artists. The fact that they snagged Igle is impressive, since this means he will be less able to work on other comics properties, if any. That shows they have a solid plan and sales record, because a person with his experience would not venture out into the staff end without feeling comfortable. I also think moving Whitley, whose comic is a huge hit with younger readers and is a perfect fit for school libraries, is a smart move. He's already got good name recognition, and now he can spend his time working to get more Action Lab titles into classrooms, which both increases and diversifies their sales. This move looks to be a winner for everyone involved and keeps the main roles of Action Lab within a core group of people who are already invested in the comics they're promoting. It shows a plan for continued growth and success for Action Lab going into 2014.